My self Ramachandra this to to state that my 8 year daughter Brunda was suffering from fever from one month. Shown to 2 to 3 clinics, but it doesn't reduce and as per doctor's advise admitted in People tree hospitals, gorguntepalya on 24th of Sept later I knew that as she was suffering from secondary sepsis, severe ascites, pleural effusion and acute kidney and lung injury. 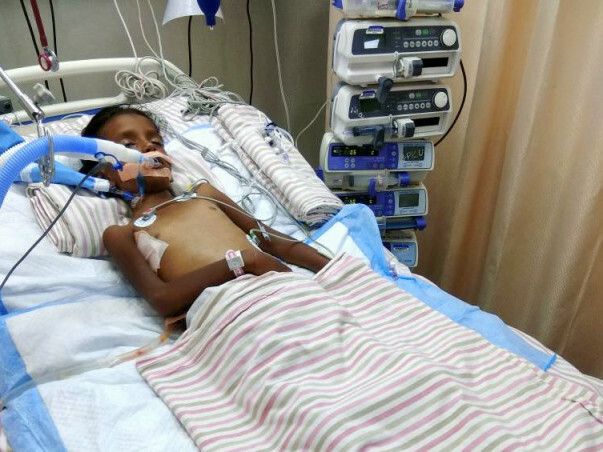 She has been in ventilator support since 10 days. I thought that before doing admission treatment will be done and Brunda will be discharged in a week and cost will be 2 Lakhs but it has crossed 6 Lakhs now. When bill crossed 2 Lakhs I couldn't shift her as she was in ventilator support so I was helpless. Need to pay some amount to continue the treatment now. As I come from poor background finding difficulty to continue treatment. 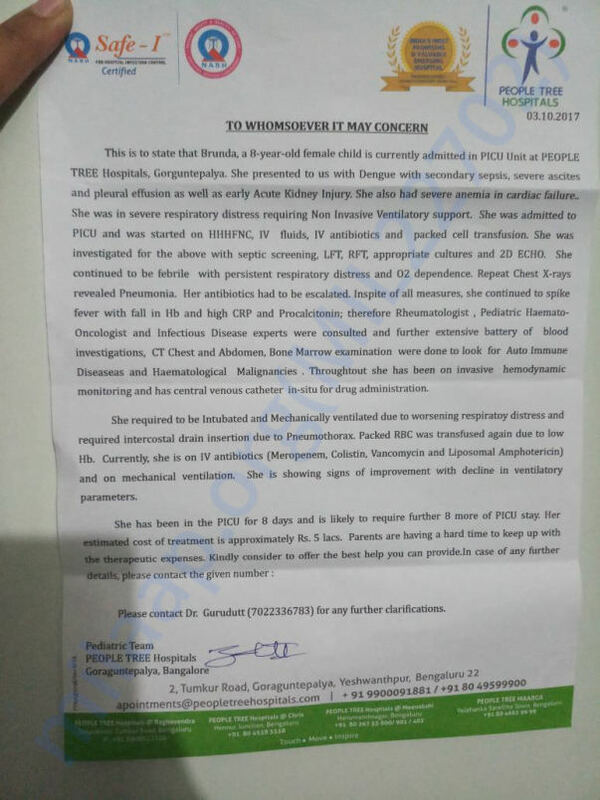 Pls help Brunda in getting treatment. Here is an update on Brundha. Brundha has been discharged two days ago. Currently, she is being taken to Nimhans. We are waiting for the doctor's response to further procedures. Making a withdrawal to meet the treatment expenses. Transferring funds to my personal account and will hand over the money to Ramachandra as he is busy with other issues couldn't collect his bank details. Thanks for your support Mr Felix, Venkatesh and others. I am withdrawing this amount to my personal account and handing over the amount to Ramachandra. As there is a problem with Ramachandra's bank details. Here is a quick update on Brundha. Brundha is been shifted to general ward two days back and he is doing good.